Lisa Hetzel: Can you live a normal life after donating a kidney? 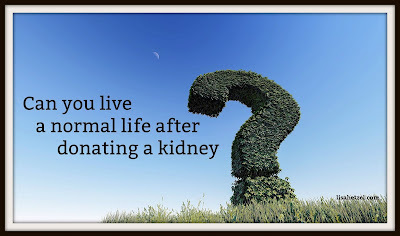 Can you live a normal life after donating a kidney? Disclaimer: I'm not a doctor and I don't pretend to be one. This post is not intended to give medical advice. ALWAYS refer to your medical professionals. In the case of transplants, that would be a transplant team. Experts would include the transplant surgeon and transplant coordinator. As a living kidney donor, I get asked about my life after transplant. Some people, after finding out that someone like me donated (I was 53 at the time! ), look at me a little differently. But considering life after a transplant is an important factor for everyone involved. When I started the process, I was relieved to find that an entire transplant team (each donor gets one) wanted to meet with me. Donor candidates and recipients have their own set of experts. Information is kept confidential and not shared between the teams. Most hospitals include a transplant coordinator, social worker, psychologist, and transplant surgeon. Each member met with me to explain their part of the process, answer my questions, and discuss how I would handle any possible complications. In my experience, they told me that the more physically active that I was before the surgery, the quicker that I would recover. Like other inpatient surgeries, there are always risks, however small. After recuperating at home, I went right back to teaching in the classroom. It took me a while to get my energy back, but within a few months, I felt "normal." As a part of the donation process, I had lab work and doctor appointments six months, one year and two years after the procedure. My remaining kidney continues to function just fine. As a matter of fact, because of the extremely thorough testing process (By the time I was done, I felt like I was applying to be an astronaut. ), donor candidates are usually among the most healthy individuals. Talk about a good bill of health. I don't have to take any special medicines or avoid any certain foods. Any changes that I needed to make are healthy choices for most people. When people ask me if my life is "back to normal," I usually say no. It's better. I'm more aware of how blessed I am to be healthy. I'm fascinated with the incredible life-saving and life improving medical advances. And, I'm passionate about equipping people with information to consider when they are facing kidney failure. Normal? No way. Better than ever. What would you like to know about life after transplant?